Prince Edward Island’s Dave Gorveatt started the Irving Oil 250 on the outside pole and dropped back slightly as the laps clicked down. Maine driver Ricky Rolfe started the event back in the 16th position and made steady progress towards the front. While Rolfe went to the tail, Gorveatt ended up going to the pits with a torn-up racecar. He wasn’t done though. He came back out on lap 85 and made less than one lap before contacting the rear of Rolfe’s #72 car and sent him off the third turn banking. Race officials parked Gorveatt for the incident and he declined to talk about it after the race. “I think that I’ll take a time out on this one,” said Gorveatt when asked if he had any comment on the incident.. There were plenty of wrecks, bumping and bruising in the first half of the race, but nobody managed to put on as much of a show as Darren Sherwood did. Sherwood’s #38 car catapulted off the backstretch and flipped end-over-end before coming to a rest just shy of several trailers in the pit area. He emerged from his upside down car uninjured. “I’m fine,” said Sherwood. “There wasn’t a lot of room out there. Somebody ran me off the backstretch a little bit and once the wheel dropped off into the sand, there wasn’t much that I could do then. Once I hit the bank with the front end, the weight of the motor dropped the front end down and I just started barrel rolling. Well, it wasn’t really a barrel roll, it was more of an end-o. I went over a couple of times before ending on my roof. Sherwood’s car looked pretty well destroyed after being towed back to its proper pit spot. Darren Sherwood's #38 on its lid and after being towed back to his pit area. While Scott Chubbuck and Travis Benjamin both towed up to Maine and dominated the Irving Oil 250, Scott Alexander wasn’t very far behind. The Canadian did not have quite the raw speed of his countryman Sean Turple, but he used his head to stay out of trouble (for the most part) and lead a few laps. He finished a strong third. American race fans might not have to venture to Canada to see Turple race. He is considering running a few races South of the Border in the future. Ricky Rolfe took a hard hit late in the race. He hit the frontstretch earthen bank nearly head on and showered the first ten or so rows of the grandstand with dirt, dust and rocks. Turple showed that his is worthy of the ride by not letting a mid-race incident ruin his day. Turple got together with the #54 of Dave Dion and heavily damaged the front end of the #0. However, he came back to finish fourth. Turple was a little bit disappointed with fourth. He was running laps times close to Chubbuck and Benjamin early in the race and who knows what would have happened if not for the damage? 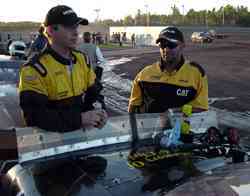 Shawn Turple (L) before the race. He didn’t walk away from the hard hit. 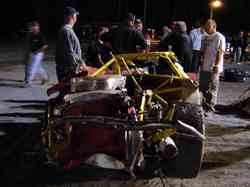 Instead, he put the car in reverse, took a few hard turns to clear the dirt off his car and proceeded on to finish 10th. -in with Dave Gorveatt weren’t the only problems that Rolfe had at NBIS. When the two drivers met in the middle, there was trouble. Less than a quarter of the way into the race, the two drivers got together with Gorveatt going spinning. This turned into a big pileup in turn three that also included the cars of Brent Wiggins, Paul Gahan, Dave Dion, Hal O’Neal and Jody Harris. Rolfe was judged to be at fault for the incident and was sent to the rear of the field for the restart. As it turned out, the trouble had been brewing for a few laps. “I got up under him two or three times and he just chopped me down and chopped me down,” said Rolfe. “Finally, I said ‘no more’ and I was going to go. They were telling me on the radio that they were telling him to pick a line. He didn’t, so I tried to pick one for him. NASCAR Craftsman Truck Series driver Johnny Benson knows a thing or two about short tracks. 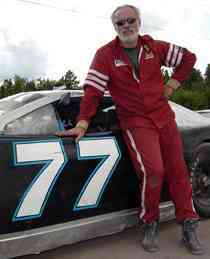 He owns Berlin Raceway (MI), is a former ASA champion and still plays with Super Late Models on occasion. In was only natural for Benson to go to NBIS and hop into a car given that background. 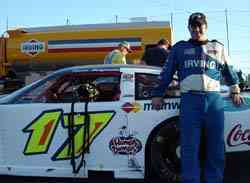 Benson landed a ride for the race in a car fielded by Dave O’Blenis and sponsored by Irving. Randy Turner and his #1 car. Benson had fun, but the long race took its toll on him. The two-barrel engine that was under the hood of Benson’s #21 car took a little bit of getting used to considering its realtive lack of power. “This was probably the least power that we’ve had, but that’s OK. It makes you work on the car and not the horsepower. So will Benson be back at NBIS in the future now that he has gotten a taste of the track? "I hope so," he said. Logging caution laps wasn’t much fun for Alexander, but the rest of the race sure was. Scott Alexander (#15) in heat race action. Alexander had a flicker of hope as the race winded down and he had second place Benjamin in his sights. Alexander had some high profile help in the pit area for the race. Gary Crooks, of the #15 Billy Ballew NASCAR Craftsman Truck Series team, came to help him out. However, Brooks had to leave early when the race ran long. A call down to the #15 shops this week confirmed that Crooks made it back to North Carolina safe and sound. 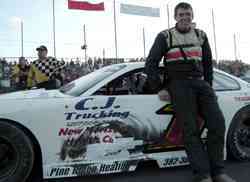 26-year-old Shawn Turple turned some heads with his performance in the Irving Oil 250. Turple was driving the hallowed #0 Atlantic CAT car owned by Frank Fraser and formerly driven by the late great Canadian racer Scott Fraser. Rolfe's #72 sits high on the banking. Randy Turner made the jaunt up to NBIS from Maine. The young Pro Stocker has been a dominant force at Unity Raceway this season and was hoping that some of his success would translate well at a track North of the Border. What he didn’t count on was the fact that the race was going to be more than a little bit rough. Turner dropped out early and was credited with 24th after making only 45 laps. Kent Livingstone towed down from Prince Edward Island and was involved in one of the numerous early wrecks. He continued on, but fell out on lap 92. That was good enough for the 20th position. The talk of his night was an incident with Lonnie Sommerville on lap 46 which ended with Sommerville sliding off into turn three and into the fence. This caused heavy damage to his #23 car. Sommerville walked back to the pits and when Livingstone motored by him under caution, he walked towards the #16 car and clapped his hands and motioned his disapproval to Livingstone, who really doesn’t know why. That was par for the night though according to Livingstone. Speed51.com attempted to catch up with Sommerville after the race, but the Saint John, New Brunswick driver appeared to have bolted after loading up his mangled racecar. Last month, Travis Benjamin finished second to Mike Rowe in an IBG-PASS event at Scotia Speedworld (NS). This weekend, he finished second to Scott Chubbuck at NBIS. This is leading to Benjamin really enjoying his trips to Canada. An added bonus is the fact that his sponsor, Irving Oil, has quite a presence in the Canadian market and sponsored the race at NBIS. The payout for Scott Chubbuck and his Cushman Engineering team for winning for $25,150 [Canadian of course]. The driver’s share of that will help with the rising price of heating oil this winter in Maine. With $50/lap leader money, was Chubbuck thinking dollars and cents when he led nearly 200 laps during the race? 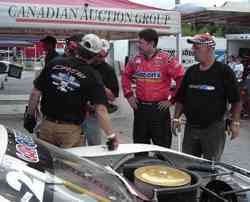 Johnny Benson talks to his crew for a weekend.